2018 has been a record-breaking year for wildfires. Though wildfires are not a top-ranking natural disaster, they can be extremely lethal if not contained. These fires serve as an example of why we must be more vigilant about our wildfire mitigation efforts throughout the US. 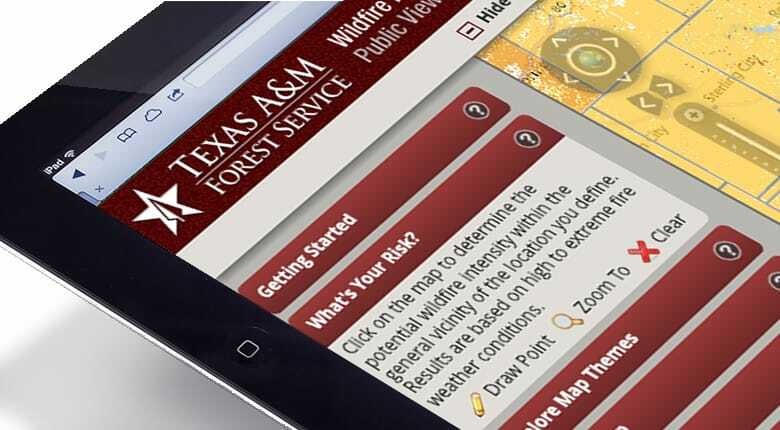 Texas A&M Forest Service partnered with Timmons Group, a national geospatial solutions firm, to develop the Texas Wildfire Risk Assessment Portal (TxWRAP). 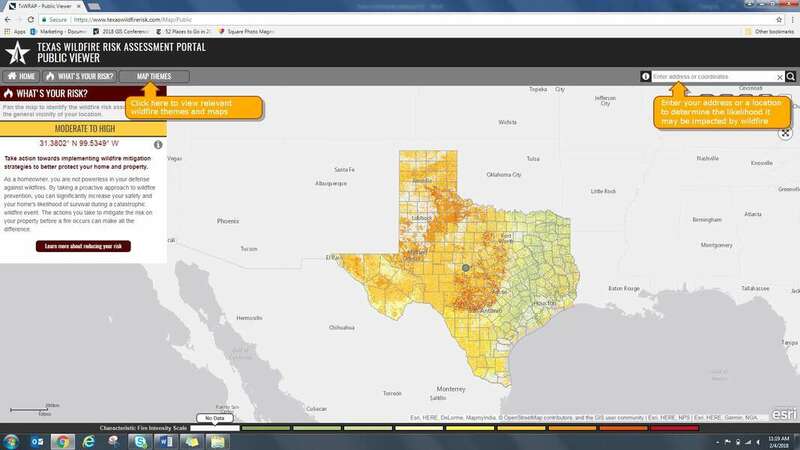 TxWRAP is a web and mobile portal comprised of a suite of web-mapping applications with the primary focus of making wildfire risk information and planning tools readily available to the public and Texas state and local agencies in a timely and efficient manner.According to the TxWRAP, over half of Texas is at a moderate to high risk of wildfires. TxWRAP is tailored to support specific workflows and information requirements for the public, local community groups, government officials, professional hazard-mitigation planners, and wildland fire managers. 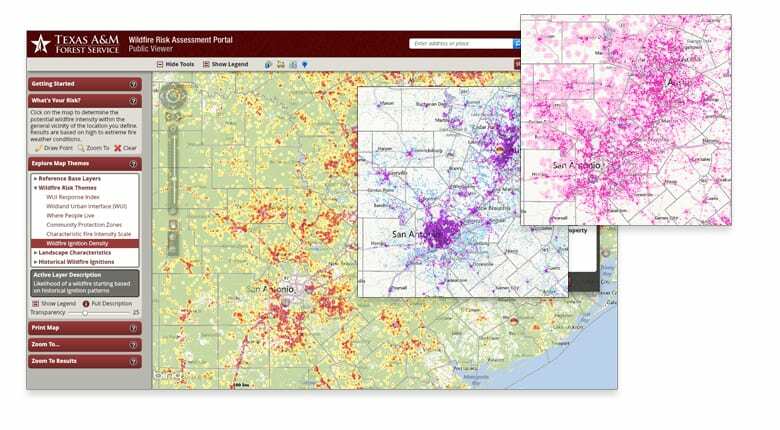 The newest addition to the TxWRAP suite is the Community Assessor tool. The Community Assessor application supports community risk assessments throughout the State of Texas. The application is used by TFS Wildland Urban Interface (WUI) coordinators and local fire departments to set up assessment projects for cities and counties, delineate community boundaries within a project jurisdiction, assign team members to projects, conduct wildfire risk assessments for those communities while out in the field, and then data and reports to be used for developing Community Wildfire Protection Plans (CWPPs). TFS is a collaborator with counties and municipal­ities in Texas and supports and maintains CWPP development. TFS has historically had a manual process to plan, coordinate, conduct, and work with local fire departments and homeowners’ associations. This included paper-based community assessment forms, non-digital tracking of community boundaries, and limited consistency in the recommendations provided to localities for their CWPP development.With the role-based Community Assessor application to help TFS and local fire departments sketch out WUI community boundaries on a map, it has efficiently enabled assigned project team members to search, download data and run reports for communities throughout the state of Texas. This enables communities, like yours, to be efficiently navigated to and evaluated by assessors for the wildfire risk of pre-mapped communities without limits to connectivity. During a field visit, if the assessor finds a new community that needs to be assessed, they simply create an ad-hoc community and can proceed with an assessment for that community. The Community Assessor web application allows users to download the Single Community Assessment Report as well as a CWPP Report that details all communities for the Project, including a map and table with the total hazard rating for each community. Finally, a map layer that shows all the assessed communities symbolized by total hazard rating is available for users of the TxWRAP Public and Professional Viewers. The Wildfire Risk Assessment Portals, designed by Timmons Group, have played a major role in the mitigation of wildfires throughout the United States. They are designed for community education and used by State foresters to assess their local forests for the dangers of wildfires. To learn more about these portals, please visit: http://www.timmons.com/projects/category/wildland-fire. Texas A&M Forest Service conserves and protects the resources and lands of the Lone Star State. Conserving Texas’ trees and forests, the state agency helps property owners maintain land and natural resources to ensure forestlands remain productive and healthy not only for the environment, but for generations of Texans to come. TFS is also one of the lead agencies for incident management in the state. From the initial response to ongoing recovery, the agency strives to protect Texas from wildfire and other types of disasters. TFS does this by not only fighting wildfire and responding to incidents, but also by building capacity and increasing public awareness about community protection and wildfire prevention. In partnership with other agencies, local governments and fire departments, TFS provides programs to aid communities across the state, giving them tools and resources to actively protect themselves and their properties. For over 25 years, Timmons Group has been a leading provider of geospatial, information architecture and engineering services focusing on developing intuitive, enterprise geospatial web applications, highly-usable, cross-device mobile applications, and integrated, geospatially-enabled enterprise solutions. Timmons Group has provided comprehensive suites of wildland fire protection planning applications and services. For over a decade, they have been an industry leader in fuels mapping, wildfire risk assessment, and fire behavior analysis. Working closely with their clients and leading wildfire experts, their robust real-time operational solutions provide the information critical for mitigation and prevention planning, agency wide incident management, dispatching, fire reporting, and situational awareness.